Gypsy Moon is a 5 reel game that ahs the Super Ways 243 ways to win that can give players plenty of great rewards. The game takes players on a magical ride into the world of Gypsy magic and fortune telling as they get to join a redhead Gypsy witch in a greatly rewarding and an entertaining gaming experience. Players can enjoy this experience for fun, right here, with demo credits. This way, they can figure out what the game has to offer prior to placing real cash on the game at IGT powered casinos. 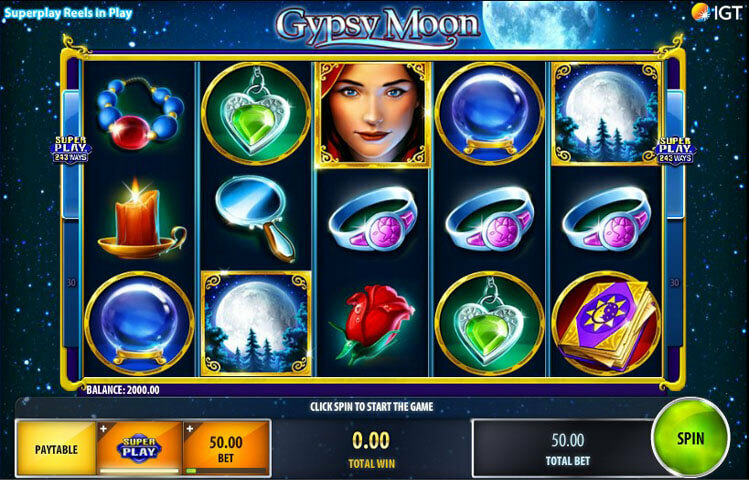 Gypsy Moon is the latest game to be released by IGT (International Game Technology). It has gone live at all online casinos that are powered by the developer, and it is already proving to be quite successful. The game has a fantastic theme that will keep players entertained and rewarded. The game has 5 reels that are home to a total of 243 ways to win. This game also has the Super Ways to win feature that can multiply the players’ rewards. Players can find all about the game’s features and its regular prizes at the paytable of the game. Players can open the paytable by clicking on the “Paytable” button underneath the reels, which is a part of the control panel. The game has 30 paylines, which is the default game play option. On the other hand, players can choose to increase their winning chances by placing an extra bet in order to activate the 243 ways to win. This means that players will have the ability to claim prizes when they get winning combos on adjacent reels from the left to the right, starting from the leftmost reel of the game. Gypsy Moon comes with a great set of rewards and special features for its players. Players will be able to find all about these features at the paytable of the game. The first of the special icons that the game has is the wild. This wild comes in the shape of the Gypsy witch. This gypsy witch will use her magical abilities in order to substitute for any of the other icons appearing on the reels and the ways to win of the game. It will replace the symbol that is going to result in the biggest payout possible. The only icon that the wild cant replace is the bonus scatter icon, which is the scatter bonus icon. That scatter bonus icons can give out scatter prizes to the players, plus activating the free spins round. Players will need to get three of this icon in order to enter the free games round.